Get your personal access to QCNet and use My QCNet Account at www.myeinserts.com. Use the drop down menu for your product name, lot number and language of the inserts. You may also learn more on the program of Unity Interlaboratory. There is a box labeled as Get Help that will provide you with various guide options. These options are language settings for the quick start guide, watch video tutorial and user guides. Please locate and examine the quick link box at the starting page of myeinserts.com. This menu aims to speed up your navigation and promotes accessibility. 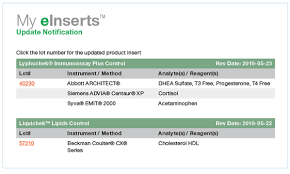 Use the available button marked with Register for Updates Alerts, Saved Inserts and Unity Interlaboratory Reports through your account. In case you need assistance with any account related issues, locate the Contact Us button at the top right area of the page. Various mailing address are listed as well as phone numbers for different countries. To speak directly with a customer service representative, please dial 949-598-1200. You may send your correspondence to Diagnostics Group, 9500 Jeronimo Road, Irvine, California, and zip code 92618.